The chess boards within this list are among the best in the chess industry, choose yours with confidence. There is a great deal of variance in chess board sizes. Even “standard” size boards may have differently sized squares. The size of chess board that you choose will depend on how much space you have available in the place you’d like to put it and also on the size of your preferred chess pieces. Many chess piece sets will come with a recommendation for what size squares they play best on, and we recommend you follow that guideline. Chess boards are just as varied as chess pieces, and can be made out of almost any material ranging from sturdy plastic to rare antique ivory. Concrete, glass, stone, and many other materials are also available. Decide whether you want a luxurious, impressive chessboard or a more practical, low maintenance one and that will help narrow down your material choices a lot. This will be partially dependent on material, but with most materials there is a fair range of colors available. Of course, black and white has become traditional for modern chess sets, but did you know that lighter and darker wood tones were originally the standard? Depending on where you’re from, you may also see people playing on green, blue, or red boards. The options are really endless! As long as there’s a good contrast between the two colors to minimize confusion, you can pick just about anything you like. This hand-made chessboard is one of the best and most high end boards made by The House of Staunton. A Matching Chess Piece Set is available, and you can save by buying them both together. 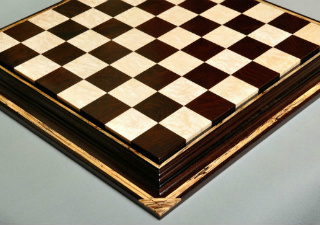 The luxurious, traditional style chess board is 100% manufactured in America. It is a bespoke item, made on a custom-order basis only. Because of this, it will take 4 to 6 weeks to receive your board, but it will be a one of a kind item that no one else but you has. 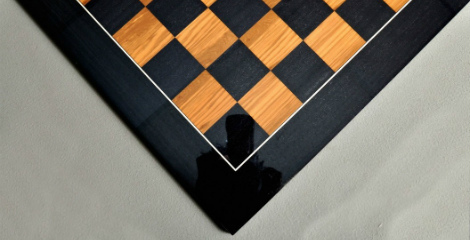 The chess board has an ebony frame with spalted maple inlays surrounding squares of maple and red amboyna- one of the world’s most rare and expensive types of wood. This is an extraordinarily high end product that will impress anyone who plays against you on this one of a kind board. 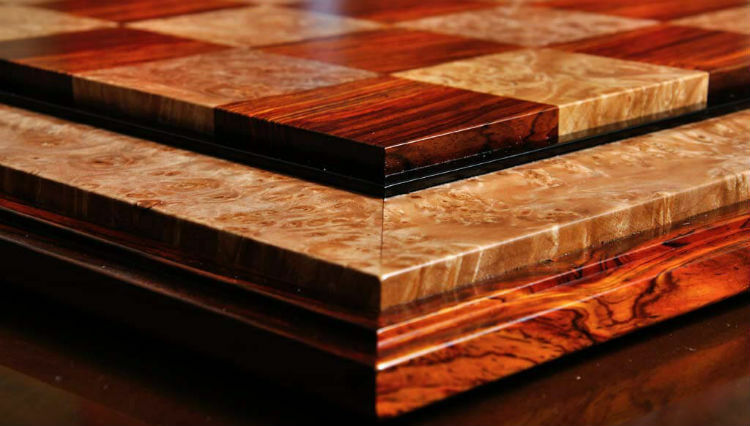 By using only the finest of materials, The Signature Contemporary Chess Board – Red Amboyna & Bird’s Eye Maple manages to exude luxury while still keeping a traditional design. Anyone who appreciates the classic, timeless style of traditional chess boards will love this and get years and years of enjoyment out of it. It provides a durable surface for game play as well as a beautiful place to display a favorite chess piece set. Whatever purpose you buy it for, you will not be disappointed, as this chessboard is one of the highest quality products on our list and out on the market for sale, period. This chess board is another member of The House of Staunton’s most luxurious high end series, the Signature Contemporary Chess Boards series. 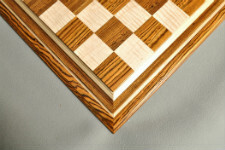 It sports a traditional, old fashioned style with bird’s eye maple and African palisander squares. The lightness of the maple paired with the rich darkness of the African palisander wood gives This Signature Contemporary Chess Board a nice, dramatic contrast, and the spalted maple inlaid in its frame really ties the whole board together. This chess board would make a great choice for the player who appreciates the traditional style with a healthy dose of luxury. Each of these chess boards is handmade to order and can be completely customized to your specifications. The craftsmanship of this board gives it an antique look with a durability that will hold up for years to come. This board is also available in a lighter colorway that features bird’s eye maple and bloodwood, to give black’s squares a lighter, slightly red tint. It’s perfect for those who appreciate the quality of the first set but prefer their boards with a bit less contrast. 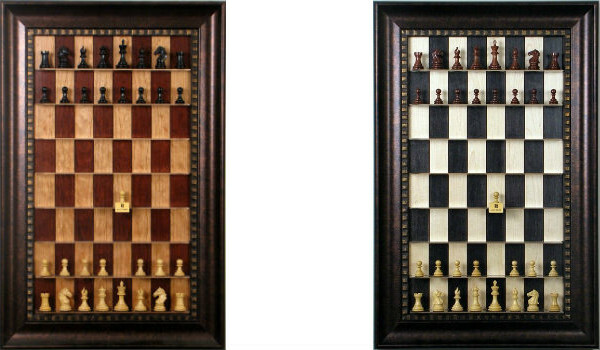 A Chess Piece Set designed to complement both of these boards is also available. The Signature Contemporary III Chess Board in Cocobolo/Maple Burl has one of the most unique colorations we’ve ever seen in a natural wood chess board. It will definitely become a conversation piece in any home or office. The natural variations in color present in both the Cocobolo and Maple Burl woods makes this wooden chess board almost look like marble! There is the option available to add a protective chessboard carrying bag along with your purchase of This Signature Contemporary III Chess Board, which we recommend doing because it allows you to buy the bag at a discounted rate. It’s great to have a chess board bag to use during storage or travel, especially with a board of such high quality. You’re going to want to keep it protected from any potential scratches and dents so that you and your family can enjoy its beauty for many, many years to come. There are only a few of these chess boards for sale, each one being made in the USA from the highest quality Cocobolo, Maple Burl, and Ebony woods. This is not an inexpensive chess board, but it’s definitely worth the money. And since there are so few of them being made, we recommend buying sooner rather than later, since you may find that they’re all gone by the time you get around to ordering one! For the tech-obsessed chess player, this is the ultimate chess board. The DGT Revelation II is not just another chess board that provides a simple playing surface – it’s actually a highly advanced chess computer that can analyze your games and play against you. With this chess training board, you can play against the strongest chess programs out there, or against a far away friend with its internet enabled game feature. 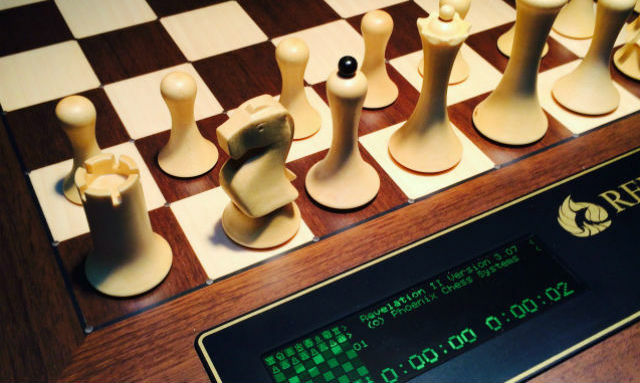 The DGT Revelation II Chess Board is the perfect arrangement for those who want to play remotely or against chess computers, but prefer the look and feel of actual chess pieces. With this advanced board, you can just make your moves as normal, and the sensors within the board will communicate with the special chips inside each chess piece to be able to tell what you’ve done. To indicate your opponent’s moves, LED lights inlaid on the pieces and the board will light up. Of course, for this particular feature to work properly, you’ll need the chess piece set that’s been optimized to work with The Revelation II electronic chess board set. But that’s not all this computer chess board can do. If you like, you can play through emulations of famous chess games, or even broadcast your own games live over the internet! Of course, it can also be used as a regular chess board in the event that you don’t feel like using all of these features. Basically, This is the only chess board you’ll ever need, because it can really do it all and then some. This chess board is part of the prestigious Signature Contemporary II line made by The House of Staunton, so you know it has to be good. 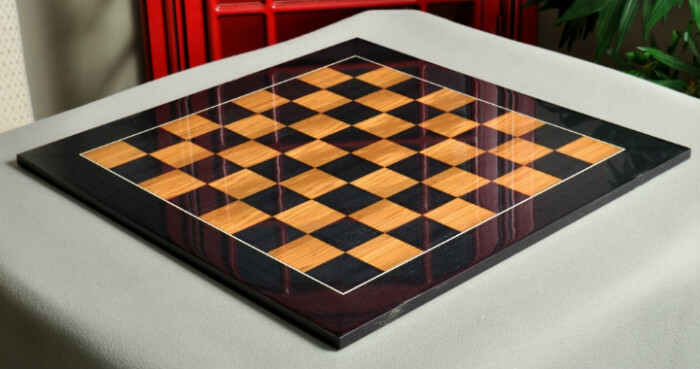 This chessboard is made from cocobolo and curly maple and has an elegant frame of genuine ebony with a striking curly maple inlay that pulls the whole design together. 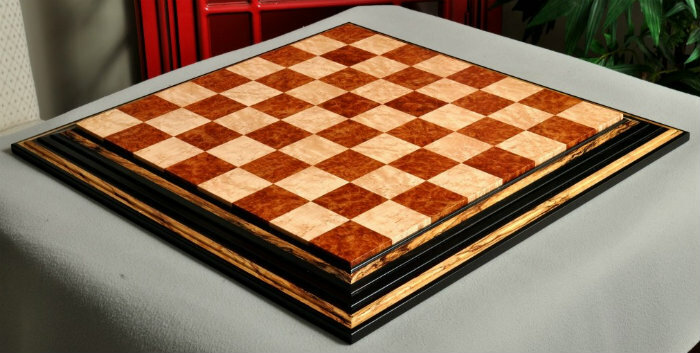 The Signature Contemporary II Chess Board is a truly beautiful board, and each one is handmade in the USA on an order by order basis, completely custom. Because they are handmade to order, each board can be made to your exact specifications. The default is a 2.5” square size and a 25” x 25” overall board footprint. The colors of this board closely mimic the traditional black and white, but also incorporate the unique warmth of the wood tones. This hand made board is extremely elegant and would blend in well with the decor in any high-end, luxurious home or office. The designers of The Cocobolo & Curly Maple chess board have paid attention to every detail, right down to laying the wood grain in opposite directions to emphasize the contrast between white’s squares and black’s squares. That’s a level of meticulousness that you don’t find in every chessboard, that’s for sure. 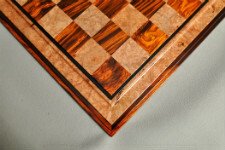 This chess board is part of the Custom Contemporary line of products made by The House of Staunton. The Custom Contemporary line also includes The African Palisander / Maple Burl version of this board which has a unique, darker coloration that gives it a very masculine feel that is perfect for the office, man cave, or bachelor’s pad. 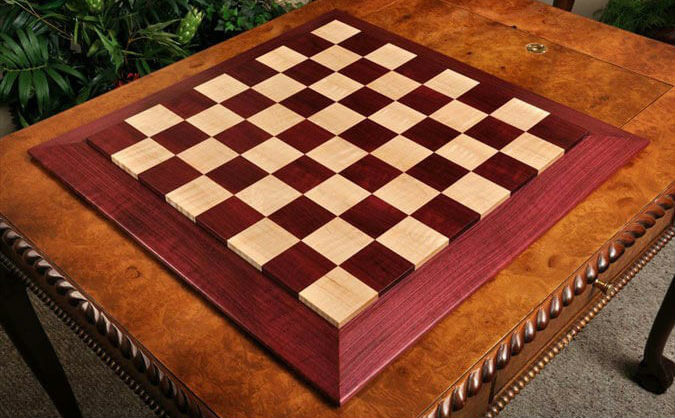 The Purpleheart & Curly Maple Chess Board Version, however, has a unique purplish red color that gives the board a fun feel. In certain lighting, the color even borders on pink. This is a step away from the more traditional design that introduces a bit more playfulness without sacrificing quality. The semi gloss finish on this chess board protects the purpleheart and maple burl woods while bringing out their natural colorations. This chess board injects a shot of the unexpected into an otherwise boring study or lounge, and will bring a smile to the face of any of your competitors! It would also make a great staging area for any of your more unique or whimsical chess piece sets. 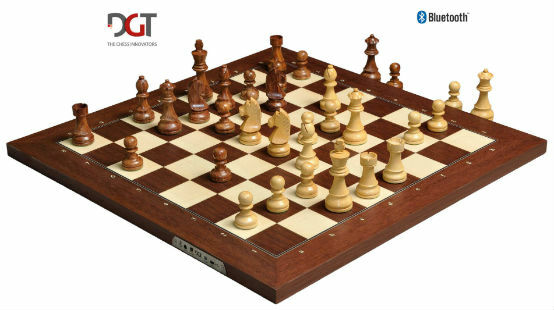 This is one of the most advanced electronic chess boards on the market, manufactured by well-known chess company DGT. At a glance, this board just looks like any other elegant, traditional chess board set. But when you take a closer look, you’ll quickly see that it’s so much more. The DGT Electronic Chessboard is decked out in LED lights, USB ports, and bluetooth technology. Definitely not your ordinary chessboard! This advanced board really brings the game of chess into 2019. Like the DGT Revelation II, this board lets you play against chess programs, friends, or online opponents. It also has inlaid LEDs and sensors that can determine what move you’ve made and indicate your opponent’s move. The main difference with this game board is that you can hook it up to your PC via USB or Bluetooth. This allows you to analyze your games in real time while playing against a human opponent and makes this board an ideal choice for tournament presentation. For on the go use, you can hook it up to the DGT Pi Computer, which is a sophisticated chess computer that’s been designed to work with these DGT electronic chess boards. To get the full functionality of this electronic chess training board, we recommend buying the full DGT set with the board, the electronic enabled chess pieces, and the portable chess computer. You won’t regret it! The STACK Chessboard is unlike any other chessboard for sale today. It has a unique design that allows it to come apart into four pieces that can be stacked up and stored in a protective leather sleeve specially designed to fit it. When it’s stacked up for storage this way, it only takes up a space about 8x8x3 inches – the perfect size for sliding into a backpack or suitcase. When fully assembled, The STACK Chessboard is a 16 inch square board with 2 inch squares. The playing surface of the board is maximized while maintaining a compact size by eliminating any decorative border from the outside edges. And don’t worry about the pieces slipping and sliding during gameplay, because they’re held together with strong magnets that provide a seamless and strong connection between each segment of the board. This product is made in the USA by an independent artist and is exclusively available at Chess House. A larger, tournament sized 18 inch board is now available also, which stacks into a 9x9x3 inch size and features 2.25 inch squares. 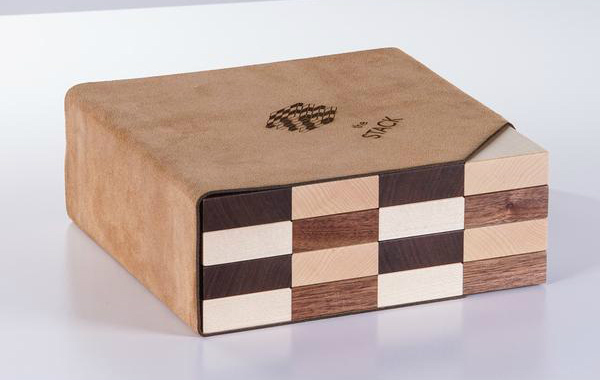 You may choose between the classic version, the tournament sized version, the Championship set with Rosewood chessmen included, or the Limited Edition set which features a beautifully crafted, magnetic Walnut display box and an engraved production number. Only 250 of these limited edition sets have been made, so don’t wait! 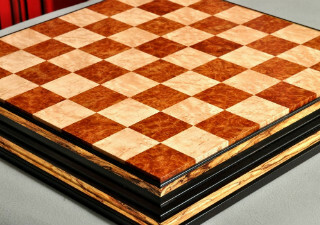 Overall, the STACK chess board is a highly unique product that is every bit as beautiful as it is functional. Its top quality craftsmanship represents an innovation in chessboard technology that is so rare with such an ancient game, and it’s available at a surprisingly affordable price! This is a lovely, antique looking chess board with built in storage for all of your chess pieces and accessories. Its shiny alabaster surface is very inviting, and with the 20” x 20” x 3.5” storage compartment below, everything you need for a game is right there at your fingertips. 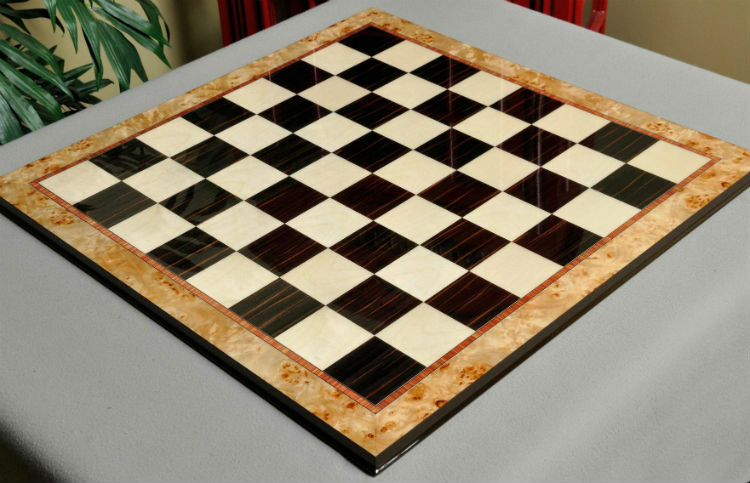 This game board is made of Italian alabaster in shades of white and amber, while the base is constructed of solid wood. The 24″ Alabaster Cabinet Chess Storage Board is handmade in Italy, and is a great value for the money when you think about the level of craftsmanship that goes into each one of these boards. 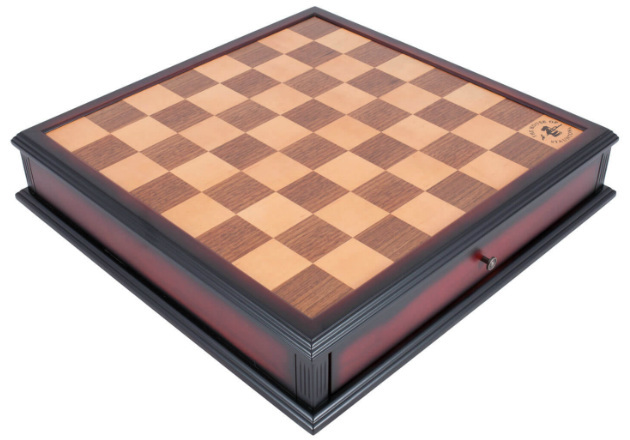 Game pieces are not included with this chess board , but the storage compartment will accommodate any set of chess pieces that are 4 ¾ inches tall or less, with a base diameter of 1 ⅜ inches or less. The storage cabinet has 37 separate compartments designed to keep your pieces organized and protected. The squares on this chess board are 1.75 inches, with a total play surface of 14 ⅜ inches. This is a very cool board, if we do say so ourselves. 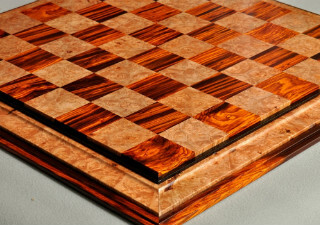 Made by well known chess board manufacturer JLP, this game board incorporates a unique feature we haven’t seen on any other chess boards lately – a live edge. What is a live edge? Well, instead of cutting the wood down and polishing it to a smooth finish, this board utilizes the wood’s natural state as a design element. As a result, the beautiful wood grain shines through and gives this board a warm, rustic look. It would not be out of place at a mountain lodge, ski chalet, or cozy log cabin home. A lot of chessboards can seem intimidating or overly fancy to the casual player, but the more simplistic design of the JLP Live Edge Hardwood Board makes it appealing and accessible to anyone. Each of these chess boards is handmade by the artist, John. He is originally from Switzerland, but now hones his woodworking skills in the well forested state of Pennsylvania. His skills were learned from his father, who learned it from his father and so on. For 5 generations, these secrets have been passed down which have largely fallen out of memory in the rest of the world. John’s careful attention to detail during every phase of the board’s construction ensure that you get a quality product that will last for generations to come. For those who want a high quality board at a reasonable price, look no further than The Maple Burl & Ebony Superior Traditional Chess Board. It has a low profile, moulded edging, and glossy finish that make it a great choice for any room. 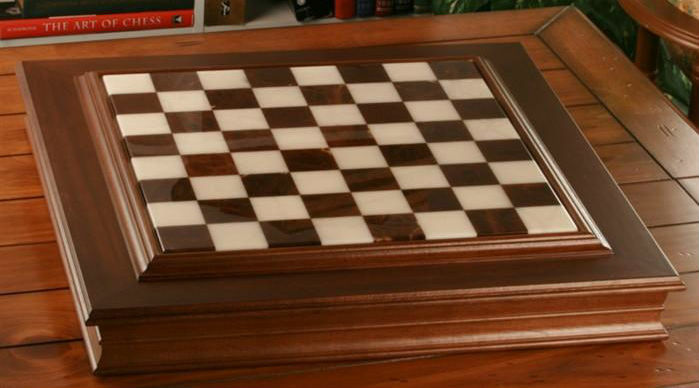 This chessboard is handmade in Italy from solid maple and ebony woods with a maple burl frame. The mixture of materials used in this board give it a modern feel, while the traditional coloration keeps it feeling familiar. At only half an inch thick, this board will take up no space at all. This is perfect for those without a dedicated chess playing space who need to store their board when it’s not in use. This one will easily tuck into a closet or lie flat on a shelf. Because this game board is so thin and lightweight, it’s easy to carry around with you as a portable travel board. Though, if you do do that, we recommend buying the optional board carrying bag that’s available with it to keep its surface protected from scratches and spills. With the proper care, this chess board will last for many, many games! This chess board embodies the timeless elegance of the game of chess with its rich, warm wood tones and classical detailing. Of course, we’d expect nothing less from a product made by The House of Staunton, as you can tell this chessboard is by the logo emblazoned on the H1 square. 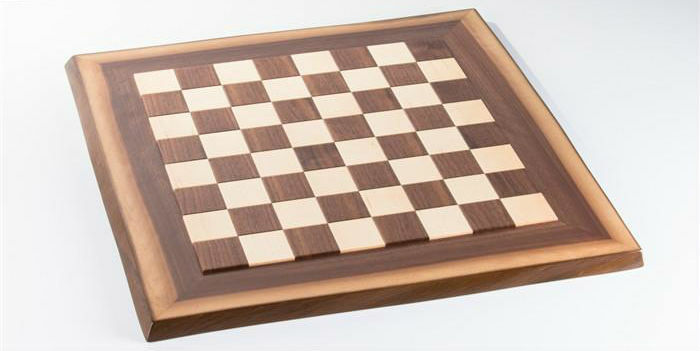 The Walnut and Maple Classical Tiroir Chess Board is available in two different sizes. You may choose the version with 1.75 inch squares which is a total of 17.5 inches square by 4.5 inches tall, or you may prefer the slightly larger version at 22.5 inches square with 2.25 inch squares on the board. Whichever size you choose, you’ll be buying a little piece of luxury at an unmatched price. Both boards are made of the finest Maple and Walnut woods, and they each have two storage drawers built right into the base of the chess board. These drawers are the perfect size for storing all of your chess pieces when they’re not being used, and there is also an additional compartment for holding your checkers pieces. The drawers do have separate compartments for each chess piece, so you will be somewhat limited in the size of the pieces you can store. The larger sized chessboard can accommodate King and Queen pieces up to 6 x 2.75 inches, Rooks, Bishops, and Knights up to 3.375 x 1.625 inches, and pawns up to 2.75 x 1.5 inches. The spaces in the smaller chess board are, of course, a bit smaller. That version can accommodate King and Queen pieces up to 4.75 x 1.75 inches, Rooks, Bishops, and Knights up to 2.875 x 1.5 inches, and pawns up to 2.25 x 1.265 inches. This chessboard is anything but lightweight and portable. Straight Up Chess Board is a wall mounted chessboard with ledges for each piece that you play on vertically. Needless to say, once you pick a wall to install this on, you probably won’t be wanting to move it anytime soon. At 34” x 22”, it is a large and imposing presence in any room, and you shouldn’t be surprised if you get a lot of questions and interest from your friends that see it. It may seem surprising because of its large size, but the straight up chessboard actually offers a great solution for those who are short on space. If you don’t have room for a dedicated chess table or the space to store a chess board when not in use, you can just mount this board on some unused wall space. It will serve a double function- as a game board when in use, or stunning artwork when not in use. It doesn’t come with chess pieces, so you’re free to use your own favorite decorative set to enhance the aesthetic appeal. The Diaxi Foldable Chess Board is a very modern chessboard that is made out of a variety of unique materials. The base of this board is its aluminum composite frame, with patterned graphite and white overlay forming the familiar squares of the chessboard. 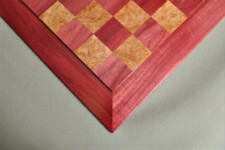 A bright red inlay runs around the border of the board to give it an extra pop of color. The edges of the board as well as its exterior are wrapped in a Moroccan leather like material that offers padding for the board both while opened and while closed. The playing surface is topped off with a layer of high grade acrylic that gives The Diaxi Foldable Chess Board a shiny finish and will keep it looking great for years to come. The most notable feature of this board is its uniquely designed, patent approved Diaxi hinge that makes its folding functionality possible. This is not just an ordinary hinge – it’s been specially designed to be seamless and non-distracting during gameplay. To that end, the hinge itself is able to rotate when not in use to lay flush with the rest of the board. With the brass details surrounding the stainless steel hinge, it looks just like a decorative element of the chess board rather than a functional one. This folding chessboard is quite compact and very good for travel or taking along with you wherever you go, and it comes at a very affordable price. To get the absolute most bang for your buck, we recommend adding on a set of chess pieces to your order for a very reasonable additional fee. Of all the chess boards there are for sale out there, this one is certainly the shiniest! If you’re someone who loves a glossy finish that sparkles and gleams in the light, you won’t find anything better than The Blackwood & Olivewood Standard Traditional Chess Board. In fact, the surface of this board is so shiny that you can even see your own reflection in it – as well as the reflection of the camera taking the pictures of it for the product listing. Looking more closely, you can also see a subtle sparkle in the Blackwood squares and border that makes this chessboard even more spectacular. This board is perfect for the person who loves all things sparkly, shiny, and glittery, but wants a grown-up looking chessboard. Both Blackwood and Olivewood are somewhat unconventional woods for chessboards, Olivewood in particular. You don’t often find boards made from those materials, but this one is so stunning that it’s a wonder more manufacturers haven’t caught on to the beauty of these woods. However, this is a veneered chessboard which may make a difference. Still, this board is a great value for the money, and it is certainly gorgeous. The high gloss finish will make any set of chess pieces look good, and it comes in 3 different square sizes, so you can choose the one that best fits the chess pieces you have. 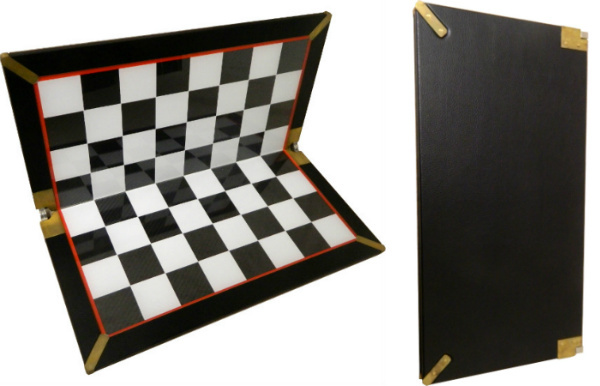 We recommend also purchasing the 24” chessboard carrying bag to go with it. That will keep its shiny and smooth finish protected during storage or transport to keep it looking good. Think about the size of the playing space you have available. Is it a large chess table or just a tucked away nook? Will you be able to keep your chess board out and in place at all times, or will you need to store it away when it’s not in use to make room for other things? Will you need to keep some space open for your chess clock? In the case of the former, you can get practically any size chess board that you like, but for those who are tighter on space, you may want to consider a space saving board like the Straight Up Chess Board or a lightweight board that’s easy to tuck away when you don’t need it, like the Maple Burl & Ebony Superior Traditional chess board. Also take into account the size of the chess pieces you’d like to use with the board. Make sure that the squares are appropriately sized to accommodate the pieces! Which material catches your eye? chess boards are most commonly made out of wood, but there are plenty of other creative materials available like glass, plastic, stone, ivory, and many more. You might want a material that matches your chess pieces, or one that contrasts with it. The same goes for your chess table. Some people even match their chess clocks to the color of their chess boards! Try the 24” Alabaster Cabinet Chess Storage Board if you prefer a more unique material, or maybe the JLP Live Edge Hardwood chessboard for a unique spin on an old classic. Keep in mind that the material you choose will also have an impact on its portability, color choices, and durability. To choose the right board, you’ll have to find a balance of all 4 of these factors that you like. Chessboards come in all colors, but it does depend on the material to a certain extent. Of course, if you’re set on a wooden board but want a bright, unique color like neon green, you could always find a painted wood board, but it loses some of the warmth and charm of natural wood. There are certain woods that can have surprisingly vivid colors, like the Custom Contemporary Chess Board in Purpleheart and Curly Maple, which has a bright pink type color. 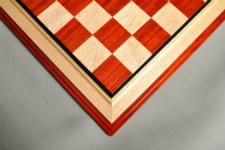 The Signature Contemporary Chess Board with Red Amboyna also has a unique coloration with the deep red hue of the red amboyna wood. Even green woods can be found! The most important thing is to ensure that the board has enough contrast between the light and dark color that you never get confused as to which is which. That would be a nightmare in the middle of a game! For the same reason, you may want to match the color of your chess pieces to the colors of your board, so that it’s always clear which army is which. The durability of any chess board will depend on the materials it’s made of, its overall level of craftsmanship, and how it’s treated by its owner. Obviously, even the most high quality, lovingly crafted board won’t hold up to hard use if it’s improperly cared for or, for example, left out in the rain. If you’re prone to mistakes, accidents, or spills, you may not want to invest in the most high quality board you can find unless you’re confident that you can take care of it. Likewise, a child would probably be better off with something cheap and portable that they can use harshly. 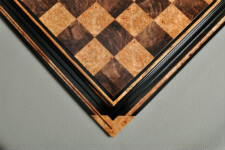 If you are in the market for an heirloom chess board, however, we recommend buying a high end board made with the utmost attention to detail. 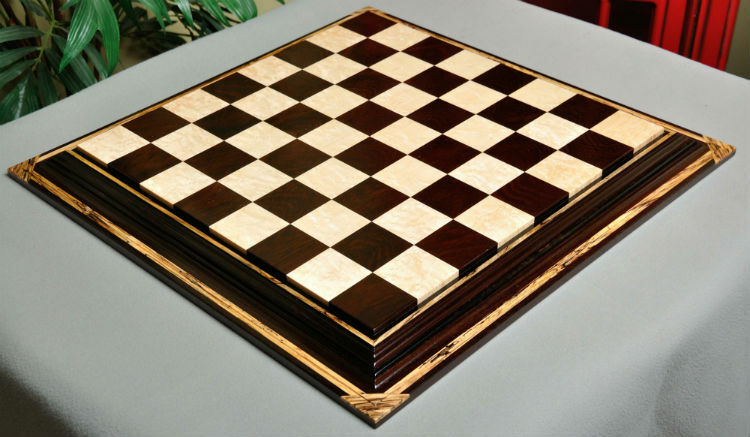 Chessboards that are handmade by a single artisan are usually great for this, like the JLP Live Edge Hardwood Chessboard or The Alabaster Cabinet Chess Storage Board. Wood is a great material for long lasting chess boards because it requires very little ongoing maintenance and can last in good condition for generations. In fact, we still have wooden chessboards in good condition that are centuries old! 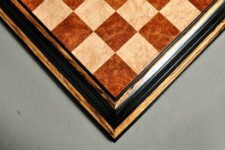 A high end, heirloom chess board will sit in a place of honor on chess tables in your family for generations. Style is a huge factor in choosing your perfect chess board. After all, if you don’t like the look of your chess board, you’re not going to want to spend hours looking at it during a game. The traditional style chess sets are undeniably gorgeous, but they’re not everyone’s cup of tea. If you prefer something more modern, check out the Maple Burl & Ebony Superior Traditional Chess Board. Even though it’s labeled traditional, the mixed materials on the board give it a modern vibe. The Summerville Cape Elizabeth chessboard is another good choice for a modern aesthetic. Its clean lines and unique shape make it a good fit for any modern home. At the end of the day, it all comes back to price. Luckily, it’s possible to find a great quality chess board in almost any price range, if you know what to look for. The boards on this list range in price from budget buys to high end splurges, so there’s something for everyone. While financing may be available for some of these more luxurious chessboards, you have to be comfortable with what you’re paying for the board of your dreams. If you’re not comfortable buying a board in 2019 and paying it off in a couple of years later, then make sure to stick with something that’s within your current means. When deciding on your budget, keep in mind that a chess board is only one part of a full chess set. Keeping the budget on the lower end will allow you more wiggle room for purchasing additional chess accessories like chess pieces, tables, clocks, and more. If you really have your heart set on one particular board but just can’t afford it, watch out for sales and discounts. If you keep your eye out, you may just be able to score an amazing deal on an amazing board! By now, you should have a good idea of which board is the best for you, or at least you know what to look for. Really, there are just a few key things to consider when you’re buying a new original chess board. To sum up, you’ll want to keep an eye out for a board that is a good size for your space, is made of the material you like, comes in the colors that you prefer, is as durable as you need it to be, and most of all fits within your price range. If you keep these few simple tips in mind while you’re shopping for a new chess board, you can’t go wrong!